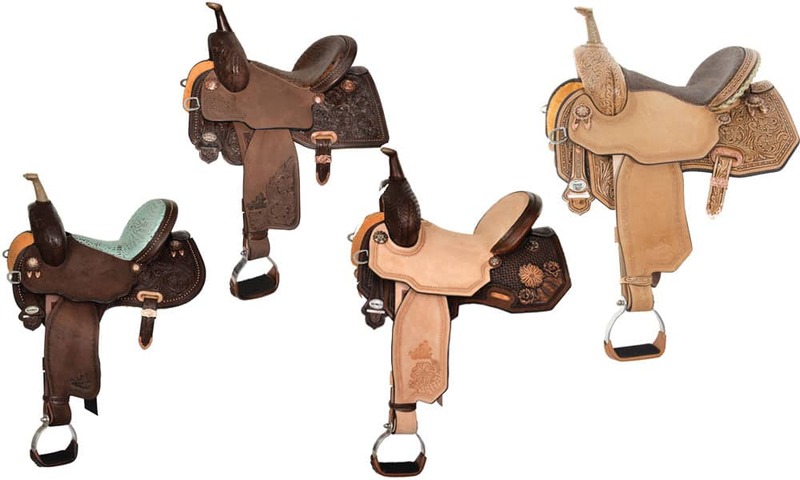 Barrel racing saddles with a wow factor! Legendary barrel racer Martha Josey teamed up with Circle Y to design saddles that turn heads. Not only do they reflect her personal style, but these barrel saddles will help you stay balanced and go with your horse’s stride. Functional and stylish, you won’t want to miss this amazing collection. Some of the saddles from the Josey Ultimate collection. This saddle has deep seating which makes it a best seller! Pictured above in a mint faux gator, it also comes in chocolate suede and cognac faux gator. The leather can be purchased in an antique brown or a rich chocolate. Gorgeous chocolate leather and copper conchos give this saddle a unique flair. It was designed by Ty Mitchell who is part of Martha Josey’s team. You’ll enjoy the look and feel of this masterpiece. Exceptional craftsmanship and style combine in this barrel saddle. The beautiful floral designs give it the perfect touch. This saddle was built with your horse’s comfort in mind. The tree allows for freedom of movement. As the rider, you’ll also enjoy the added support from this carefully constructed saddle. When you want faster times, invest in a quality saddle!